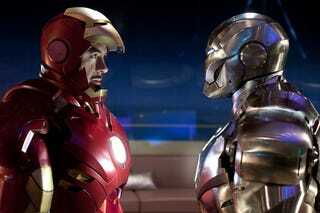 Ben Snow of Industrial Light and Magic recently spoke about the CGI sleight of hand that went into Iron Man 2. He discussed the various armor designs and the movie's ties to Cartoon Network's classic cartoon Samurai Jack. Spoilers on! In terms of a particular scene, I agree the fight where Iron Man and War Machine team up to battle the Hammer drones was a big challenge. We started with some terrific pre-visualisation that had been created by Genndy Tartakovsky, the creator of Samurai Jack and the original Star Wars Clone Wars cell animated series. Also collaborating was Tommy Harper's stunt team who came up with some cool action and Dan Sudick's special effects team who set off real explosions on set based on where we'd be adding the CG fighting. Filming was a challenge because of limited time, and then a lot changed in the story that required us to create many new backgrounds synthetically, and come up with new shots when an additional action beat was added late in the game. The idea is that War Machine was based on the Mark 2 silver flying suit from the first Iron Man, and then tricked out with all sorts of weaponry by Hammer industries working with the U.S. Military. Legacy effects provided partial practical reference costumes for Iron Man and War Machine on the film, but the War Machine you see in the film is entirely digital, and we ended up changing the design to make the materials look a little darker and more metallic. Finally, Snow discussed how he tried to ground Hammer's drone squad in reality: by embellishing them with real-world military touches. For the drones we modified and added the weaponry, using the types of weapons used by each of the branches of the military as a basis, and also work out their final paint job and materials. For the air force drone we matched the radar-invisible look of real aircraft – so successfully that they weren't showing up well enough on film and we had to cheat in more reflectivity to the materials. For the Marine Drone we devised a version of the modern digital camouflage and added a slightly shimmery quality to make them stand out. Sounds awesome - American audiences will be able to witness the fruits of Snow's labors come Friday.